Cape Town, South Africa, the continent’s second most visited city and most popular tourist town is about to run out of water. This last one written cheekily on the walls of almost every bathroom stall, but also used by the city in their campaign to getresidents and visitors to drastically reduce their water consumption. Water conservation is on everyone’s mind. Living in Cape Town you quickly learn not to flush unless necessary and to shower in 30-second bursts. Buckets are everywhere, reusing shower water to flush toilets and repurposing washing machine “gray water” for your lawn. Things are getting very serious over here. There is even a countdown clock to Day Zero, the day the taps will be turned off. 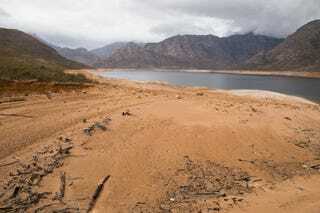 It seems there’s a real possibility that Cape Town may become the first major city in the world to run out of water. How did this happen? A mix of factors, including increased population and water consumption. But the main culprit is a drought that has lasted several years, with the last 2 years being the driest in a century. With temperatures getting hotter and summers getting longer, people are very worried not only about this current water crisis but the future of their water. And as the mayor of Cape Town announced on Twitter, climate change is making that future uncertain. Like most weather-related problems, it’s hard to assign direct connection to climate change. Extended summer heat cuts into rainy periods, and changes in temperature and pressure can alter weather patterns. For regions like Cape Town and others that rely almost entirely on rain and river water small changes in climate can have very damaging effects. In the meantime Cape Town is pushing conservation efforts (individuals are being asked to reduce water consumption to 87 liters per person per day; commercial water use must be reduced by 20%) and hoping this plus other solutions like desalination will materialize in time to get them through the year. Is this the new normal? Will climate change make life even more difficult for a continent struggling to properly provide for all its residents? Unknown, but it seems likely that South Africa will see more dry years than wet during the next century. For a full explanation and meteorology crash course, see this in-depth analysis by Climate System Analysis Group of the University of Cape Town. The crisis facing Cape Town is a real-life example of how changes in climate can have devastating effects in unforeseen ways. And it also highlights one of the major sticking points from the Paris Climate Accords. Africa has by far the smallest share of global greenhouse gas emissions for its population, yet according to this report by the Brookings Institute, Africa also is home to 7 out of the 10 countries that are considered the most threatened by climate change. Extreme weather events will be most devastating on rapidly growing areas that do not have enough wealth or infrastructure to withstand potential climate problems. It’s basicially the exact opposite of poetic justice. The silver lining, if any, is that people are learning the importance of water conservation. I for one will never leave the shower running again. And hopefully the frightening possibility of actually having the taps turned off in a major metropolitan city (one with so many residents living in poverty) will spur a few more people into taking climate issues seriously. Hopefully.